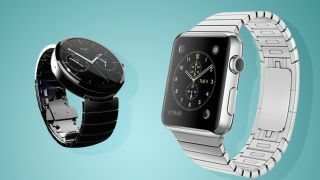 Smartwatches have a lot of exciting functions, but sales are, shall we say, "steady" so far rather than massive. General consumers are struggling to see why they'd need one. "Surely it's just a tiny phone that you strap to your wrist?" they cry. Thing is, that's more or less what everyone said about tablets just four years ago. Now everyone has one. So what's going to nudge smartwatches over the tipping point and into wild success? Here are the features hardware and software developers are working on right now that will soon be in future iterations of the Apple Watch, Moto 360, LG G Watch R, Asus ZenWatch, Pebble and the rest. You can already control your home heating with a Pebble or Android Wear piece, so long as you have a Nest smart thermostat and the right app. Oh, and you can start certain cars. The smart home market is another area with massive potential, but where punters aren't yet really biting. Tech brands would love to see home-based IoT provide smartwatches with their first real killer apps. And to that end, it surely won't be long until you can heat the oven, fade the lights up and down, monitor your home security cameras and adjust your heating and music settings from your tech timepiece. The big noise at the moment on this front is "Works with Nest", the system devised by Google's Nest that lets other sorts of devices be controlled using its own brand of commands. The important bit here is that it creates a standard that other smart gadgets can sign up to, rather than trying — and often failing — to do the job themselves. With Samsung going balls out for IoT connectivity in 2015 and Sony et al using Android in their tellies, we're confident most of this and next year's TVs will be controllable via your Android Wear watch as well. Just because Nest is owned by Google doesn't mean the Apple Watch will be left in the lurch. There's already a Nest app on iOS, while Apple's own HomeKit waits in the wings. Okay, there is some doubt that smartwatches, and wearables in general, will become massive as consumer devices. However, if legislation and medical practice allow, they will be massive in the health field. An early application that could be genuinely life-changing is monitoring glucose levels for diabetics. Google has already shown off a smart contact lens that constantly monitors your glucose levels, while Samsung has said it's looking into non-invasive ways to do the same in future versions of is Gear watch line. The Gear S already monitors your heart rate, UV levels and air pressure. Interestingly, a diabetes-monitoring watch can lay claim to being one of the very first "smartwatches". The Cygnus GlucoWatch, released way back in 2002, monitored glucose levels through the skin every 10 minutes. It wasn't perfect, with less immediate results and lower accuracy than the standard finger-prick test. The current state of the art: there's an app from DexCom lined up for the Apple Watch that receives data from DexCom's tiny sensors, which actually sit beneath the skin. Smartwatch makers and app/accessory developers would doubtless love to monitor our health in all sorts of ways. However, once you move beyond the current low-level fitness monitoring devices, you run into a brick wall of government regulation. And let's face it, if you relied on a smartwatch HR monitor for medical-grade health updates, you'd probably spend a lot of time in A&E on precautionary visits. As the mill pond of wearables become a great swirling ocean of tech, some brands are trying extremely hard to stand out. Trying harder than most is the Ritot, the first projection watch.